Of the many challenges in being a self-published/Indie author producing a quality product that matches publishers’ products is one of the toughest to meet. The book cover is a major part of that challenge. It’s the shop window. 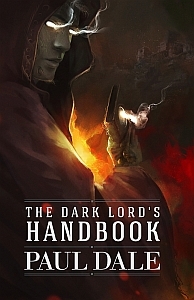 While happy with the cover I produced for The Dark Lord’s Handbook, I am not an artist, or a graphic designer, and I think a better job could be done. Having commissioned a cover for the sequel, and being very happy with it, I went back to the artist and commissioned a new cover for the first book, and here it is. The artist is Jaka Prawira, who can be found on Facebook. I find Jaka’s work subtle and striking. There is clearly some licence used in the picture (Morden doesn’t really have glowing eyes) but that’s fine with me. What I’m pleased about is that this is clearly a Dark Lord, and yet he seems mysterious. Can’t wait for the new book (no really take mercy before it drives me crazy)!